This is the sixth part of my guide for Ajanta caves. In the previous episodes of this guide, I introduced caves 1- 15. You can find the older articles in this series here. This guide for Ajanta caves 16 and 17 is also based on the studies of famous Ajanta historian Walter M Spink. The elaborate cave 16 of Ajanta was donatedby the powerful Vakataka chief minister "Varaha Deva". Construction of cave number 16 started in AD 462. 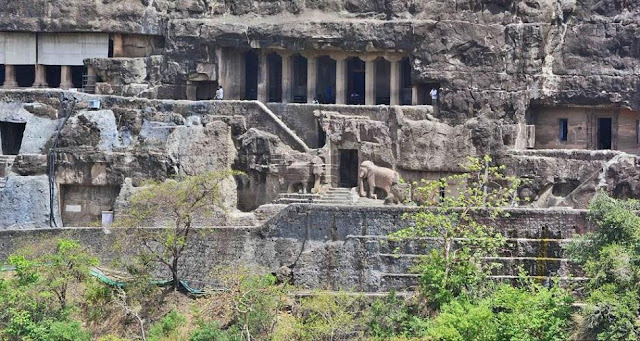 It was one of the earliest caves at the Ajanta site. At the entrance to this cave there is a gate flanked by two stone elephants leading to a tunneled staircase. Near the stair case there is an inscription about the donor of Ajanta cave 16. It describes "Varahadeva, who governed the country righteously" as the chief patron of Ajanta cave 16. The location of Ajanta cave 16 is also very important. It is located at the center of the horse shoe shaped ravine. In ancient days, entry to the Ajanta caves were from Waghur river flowing below it. There were stairs leading from the River bank to the Ajanta caves. If you hire a guide for Ajanta caves, he/she would definitely explain the cave 16 in detail. As one pass through the elephant gate, the visitors will encounter the sculpture of Nagaraja. He is depicted as the guardian of cave 16, seated in a position that demands worship and respect. Near the tunneled staircase that leads to Ajanta cave 16, there is an inscription describing about the patron of cave 16. It is not easy to spot this inscription, but if your ask your guide for Ajanta caves, he would show it to you. The inscription describes the virtues of the patron as " beloved by the king and the subjects, governed the country righteously, and was extremely devoted to Buddha, the teacher of the world". It is worth noting the fact that while the Vakataka prime minister Varahadeva was a Buddhist, the Vakataka emperor Harisena was a follower of Hindhuism. It is interesting that, prime minister following a different religion than the emperor was not an issue during those times. The front porch of Ajanta cave 16 is relatively simple with huge octagonal pillars. Interior of the cave 16 is a spacious Vihara with a Buddha idol in the sanctum. This type of Buddha idol is known as "Bhadrasana". It loosely translated to "sitting in a stable position". This is considerably different from the earlier idols of Buddha. There are many paintings in Ajanta cave 16. Many of them are in much ruined state. Some of the paintings depict the Jataka tales such as Kumbha (depicting the ill effects of alcoholism), Hastin (the generous elephant), Maha-sutasoma Jataka. 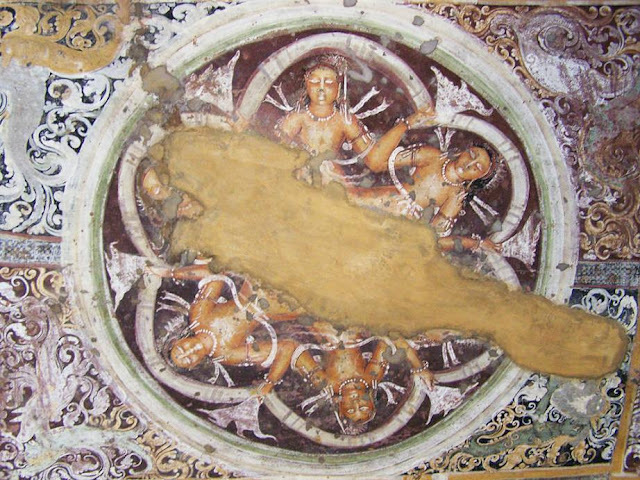 Only a qualified guide for Ajanta caves can locate and explain these paintings which has suffered a lot of damage over time. The patron of cave 17 was King Upendragupta, who ruled the region around Ajanta. The prime location of the cave is justified as it belonged to the powerful local ruler. However, Upendragupta could not enjoy a long term as King. He was overthrown by the neighboring Asmaka rules sometime around 470 AD. Upendragupta had an ambitious plan for the caves 17,18,19,20 and 29. Like cave 16, this cave also have a tunneled staircase leading from the below river up to the front porch. The front porch of Ajanta cave number 17 resembles that of 16. It would have definitely taken reference from cave 16. There are stout pillars in the front of the porch, which are slightly more decorated than that of cave 16. Ceiling of Ajanta cave number 17 is decorated with floral and geometrical motifs in bright colors. According to Spink's research, these paintings must have been a collaborative effort by a group of artist belong to the same family. There is consistency in paintings, yet there is remarkable individualism. Interior of Ajanta cave 17 has a double bay lined with pillars and the walls are covered with exuberant paintings. The pillars near the central shrine is highly ornate. The shrine has an antechamber in front of it. Inside the sanctum, one can see the idol of Buddha, seated in Padmasana. (The lotus position). He is flanked by two attendant Bodhisattvas on either sides. A visitor to Ajanta cave should never miss the cave number 17, for it has the largest collection of ancient paintings. Many of them are beautifully preserved as well. If you hire a guide for Ajanta caves can show you at least ten to fifteen such paintings inside the cave number 17. As this cave has a large number of notable Jataka tales. Let me start with the cave porch. A variety of floral motifs adorn the ceiling of Ajanta cave 17. The ceiling is divided into multiple panels separated by border designs. A close observer can note that each floral design is different. The delimiting designs are not always perfect, for some of the lines are slightly slanted. There is a central medallion on the ceiling which depicts six figures standing in a circle with their hands joined. According to Spink, this might represent a popular game where the group of players stand in a circle and keep the ball afloat with their feet. Apparently this game is still popular in Maharastra region of India. On the right wall of Ajanta cave 17 porch, the story of the angry elephant Dhanapala is depicted. The painting shows an angry elephant charging through the streets. The story goes like this. Once upon a time, a King named Ajatashatru had a pet elephant named Dhanapala. The elephant was always furious. When it is released for walking around, King used to issue a notice to his townsmen. Once Buddha visited the Kingdom. A jealous monk wanted to harm Buddha. He requested Ajatashatru to release the elephant while Buddha was planning to have lunch at a devotee's house. Buddha was unshaken at the sight of the elephant charging at him. The elephant soon recognized the divine benevolence of Buddha and became calm at once. He followed Buddha and waited outside the house where Buddha had his lunch. When Dhanapala was eventually separated from Buddha by the care takers, he ended his life in grief. The painting above shows a street scene, with Dhanapala charging. On the top the shop keepers are closing their shops in a jiffy. The painting continues to the right side, where Buddha is shown with his devotees. The entire story is narrated in an extended area. On the rear side of the porch wall of Ajanta cave 17 is the bright painting of Udayin and Gupta. Udayin was a courtier of Kapilavastu and messenger of King Suddhodhana. He fell in love with Gupta, widow of a minister's son in Shravasti. They are depicted as having a happy time in their palace attended by many servants. Once Udayin met Buddha and decided to leave the family life to become a monk. Gupta was disappointed. However, she also joined Buddha as a monk later on. The colors used in this painting are especially striking vermillion, lapiz lazuli and emerald blue. Such lavish use of colors also indicates that the patron of this cave was very rich. On the top of the porch door of Ajanta cave 17, there is a much celebrated painting of eight seating Buddhas. They represent the Buddhas of the past, present and the future. One thing that strikes an observant visitor is the difference between the first five Buddhas and the next three. The first group of Buddhas have a different style of Halos, thrones and style of robes. However the striking difference between the first group and the second is the skin tone of Buddhas. Four Buddhas starting from the left has dark skin tone – almost black. The fifth Buddha has a grayish complexion. However the last three Buddhas have fairer complexion. Below the 6 Buddhas, six couples are depicted. According to Spink, they might represent the ideal male and female prototypes of the time. It is very clear painting of Buddha accepting the begging bowl from his son Rahula. Buddha's wife Yasodhara was devastated after he left palace. She tried to cajole him back to the palace enchanted dumpling. Rahula offered Buddha the enchanted dumpling in the begging bowl. Buddha realized it and offered it back to Rahula. Later, Rahula also followed Buddha's footsteps and became a monk. It is the story of the six tusked elephant (hence named Shaddanta). This elephant was the head of his heard who grazed in the Vundhya mountains. Once he found a flower that fell from the sky, and gifted it to his second wife as he saw her first. The first wife was furious. To take revenge she pleased the Gods and acquired a better rebirth. She was born as a queen. The queen pretended to have an ailment and demanded a medicine made out of the six tusks of the elephant Shaddanta. King appointed a hunter. The hunter shot a poisonous arrow at Shaadanta, but due to the virtue of his character, the Shaddanta was unharmed. The hunter fell at the feet of the elephant seeking forgiveness. The generous elephant readily forgive him and even pulled out all his six tusks and presented to the queen. This is the story of a great monkey (Maha-Kapi). He was the head of his herd. The king and his subjects used to live near a river. They had a tree. The fruits of which were so delicious that the king had instructed others that it should never fall into the river. He was afraid that it would reach humans and they would soon come and hunt the monkeys down to obtain the fruit. But the monkeys did not listen to the king and the fruit did fall into the river and reached the humans. The monkey king helped all his subjects to escape sacrificing himself. He was almost dead, when the King of the humans observed this great sacrifice. The king brought the monkey back to palace and took care of him. Later the great monkey advised the king about the duty of a ruler towards his subjects. Samsara Chakra is a wheel that represents different worlds. Most parts of this insightful paintings are damaged. The wheel is divided into different arcs. The upper left corner show the Asura world. Then there are depictions of the world of Gods, humans and the world of Ghosts. The lower areas of the wheel are completely erased. According to some books, they might probably depict creatures of different hells.